Trying to summarize “consensus” views is always difficult. 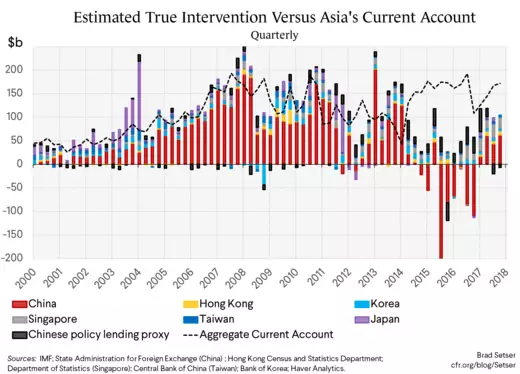 But my general sense is that most economists now believe that Asia’s external surplus is a significantly smaller problem than it once was (largely because China’s current account surplus has fallen substantially as a share of its GDP)* and that Asia’s surplus is no longer maintained through intervention (largely because China hasn’t been intervening in any obvious way over the last 12 months, and it was selling reserves in 2015 and 2016). I don’t fully share either opinion. China isn’t the only surplus country in Asia. China’s surplus is down in dollar terms (though it likely is also a bit understated, thanks to high tourism imports. But Japan’s surplus is as high as it has ever been (aging, though you can argue that Japan is now is getting to the point where it should draw on the income from its accumulated assets). And the Asian NIEs’ (Hong Kong, Singapore, South Korea, and Taiwan) surplus is significantly larger than it was before the global crisis. The NIEs, excluding Hong Kong, have a combined current account surplus of almost 10 percent of their GDP. As a share of East Asia’s combined GDP the surplus is down—but I think Asia’s surplus also should be assessed relative to the GDP of its trading partners, and the fall there is less impressive. 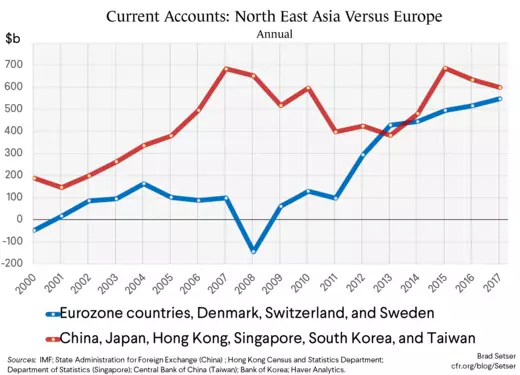 Bottom line: I am not sure that it is possible to argue that the Eurozone surplus is too big and not to think that the surpluses of some Asian economies aren’t also too big. I personally think both are larger than would be optimal. And then there is the question of intervention. 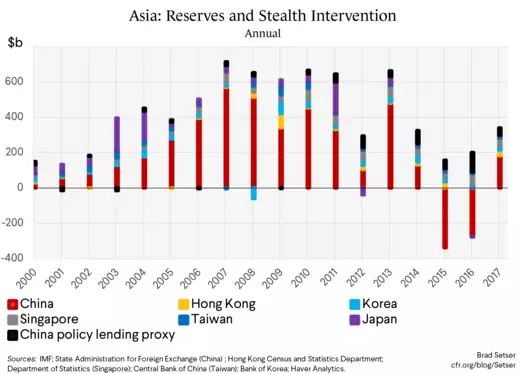 East Asia in aggregate did sell reserves in 2015 and 2016—largely because China sold reserves. And that was a significant shift from the preceding years—what Gagnon and Bergsten’s have deemed the decade of manipulation. But, well, the time they are a changing (again). 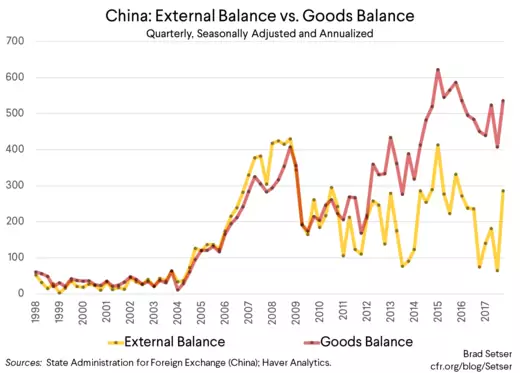 Chinese official asset growth—using the broader measure that captures the increase in the foreign assets of the CIC and the policy banks—actually is about equal to China’s current account surplus these days. 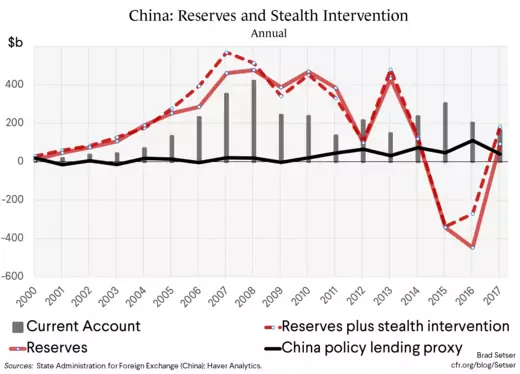 **** Reserves, at least in the balance of payments, rose by close to a percent of China’s GDP, and the state banks also added to their foreign assets. Korea, Singapore, Taiwan, and Thailand (though it isn’t in this data set) also continue to intervene and add to their reserves—those are the key countries in what I call the new arc of Asian intervention. Korea and Singapore continue to add to the foreign assets of their respective sovereign pension fund and sovereign wealth fund. Korea’s surplus also is sustained through sizable outflows from Korean insurers, though it seems likely that (for now) these flows are hedged. Some in the market have noticed this too. But I have some new tricks up my sleeve—I am now tracking these flows quarterly, and in recent quarters, official outflows have accounted for over 50 percent of Asia’s $175b ($700b annualized) current account surplus (I am escalating a chart war with Deutsche Bank!). 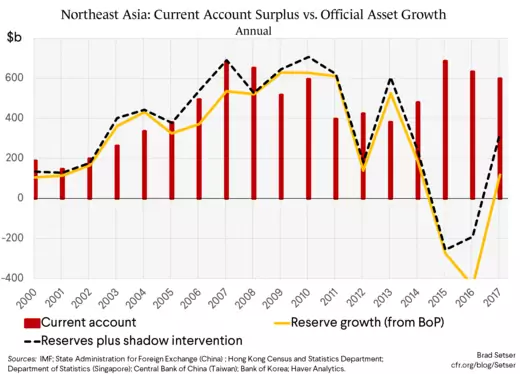 Taiwan doesn’t have a sovereign wealth fund, and its reserve growth (around 2 percent of its GDP) is well below its current account surplus. But in Taiwan’s case we know where the outflows are coming from—Taiwan turned its insurers loose a few years ago. 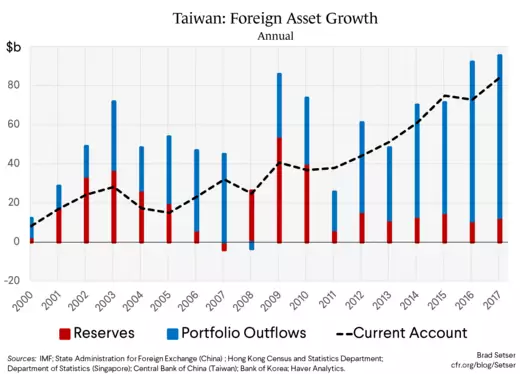 They account for the bulk of Taiwan's (huge) portfolio outflows. I (and others) doubt the insurers are fully hedged—which implies that they are in effect betting that Taiwan’s central bank will continue to manage its exchange rate and control the pace of appreciation. With the return of official asset growth, the counterpart to East Asia’s surplus is once again easier to track than the outflow out of Europe —especially if Taiwan's life insurers are added in. There though is one exception: Japan. I haven’t found a good measure in the balance of payments of the outflows from Japan’s government pension fund. (a) China's true surplus is bigger than its reported surplus, not all of the tourism deficit is real. See Anna Wong's work [PDF], or compare the numbers of China's tourism academy to the official balance of payments (the tourism academy's number is about half the size of imports in the balance of payments). (b) China's goods surplus was actually trending up late last year; export volume growth has been strong. And the goods number is a bit more reliable (and a bit less volatile) than the current account number these days. Obviously this predates the run-up in oil prices. (c) Much of the fall in the current account surplus was a function of the fiscal and credit stimulus, which China now wants to scale back. Looking at savings alone misses this. ** If oil stays around $70 a barrel, Asia’s surplus should fall this year while the surplus of the oil exporters will rise (the global breakeven in 2016 was around $50). *** For most countries my broader measure includes the change in the central bank's forward book and portfolio outflows (e.g. the buildup of foreign assets) by the "government" sector as reported in the balance of payments. My measure thus should capture Singapore's GIC (which manages the assets of the provident funds as well as a portion of reported reserves) and Korea's National Pension Service. For China my adjustments are a bit more complicated. **** For "stealth" intervention I have added in portfolio outflows (largely from the CIC and the state banks historically) and the balance of payments line item that corresponds to the banks' "other foreign assets." If China released a split between government portfolio flows and private flows I would use that, but China doesn't. For policy lending, I have counted all long-term loans in the balance of payments. I go back and forth on whether I should use "net" or "gross" loans. I can justify all these adjustments using the released data on the foreign currency balance sheet of the state banks as well: the split between the state commercial banks and the formal policy banks can be debated, but there is no question that the state banking system generates the bulk of the portfolio debt outflows and has generated a steady rise in China's long-term cross border lending.